ADMIN! - K45286 lives on! 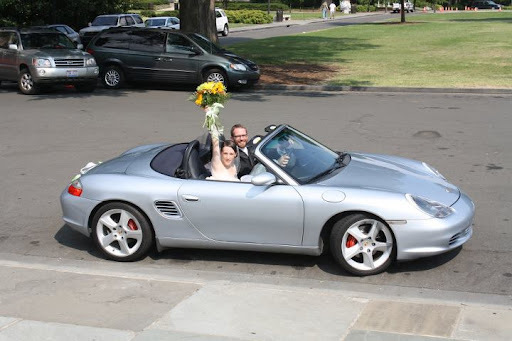 Although it wasn't a registered plate (mom moved along with the Boxster to Kentucky in 2008), Dad still made an appearance at my wedding on July 23 at the Duke University Chapel. The Boxster was hand washed that morning, and dad's license plate attached with double-sided tape for pictures. Our professional photographer knew the importance of my dad's car, so he also got some shots following us around town between ceremony and reception. Happy to see Pedro's Board is doing well! Edited 1 time(s). Last edit at 08/09/2011 01:09PM by Pedro (Weston, FL). ... we are all very happy for you. Just wishing your Dad could have been there. Have a great life together and don't be a stranger.